Science Fiction Author. Futurist. Geek. Gamer. Every now and then a brilliant new author comes along to move the leading edge of speculative sci-fi along in dramatic and stimulating ways. In Exin Ex Machina (Asterion Noir Book 1), Nika has a tattoo of a phoenix constellation spanning her upper back. It plays a significant role in helping her connect to her lost past, as well as tying into the plot in other interesting ways. Stock model courtesy of Marcus Ranum (http://www.ranum.com/). Stylistic representation of the view from the cockpit of Alex's ship, the Siyane. This was the first piece of concept art I did specifically for Aurora Rising. I particularly wanted to create a distinctly bright, crisp, hyper-defined view that seems to shine from within - both the display and the galaxy. 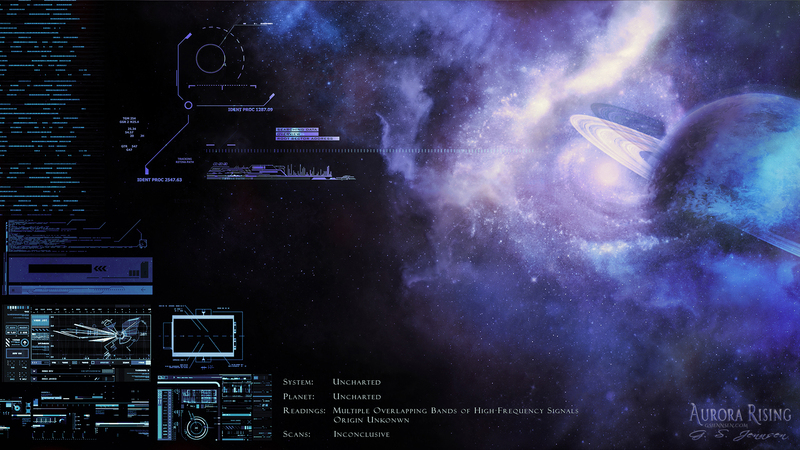 Inspired by a possible view of the Metis Nebula approach (the data display borrows heavily from Starship HUD). It was intended as the second piece of concept art specifically for Aurora Rising; however, I ended up taking a lot of liberties with the representation. 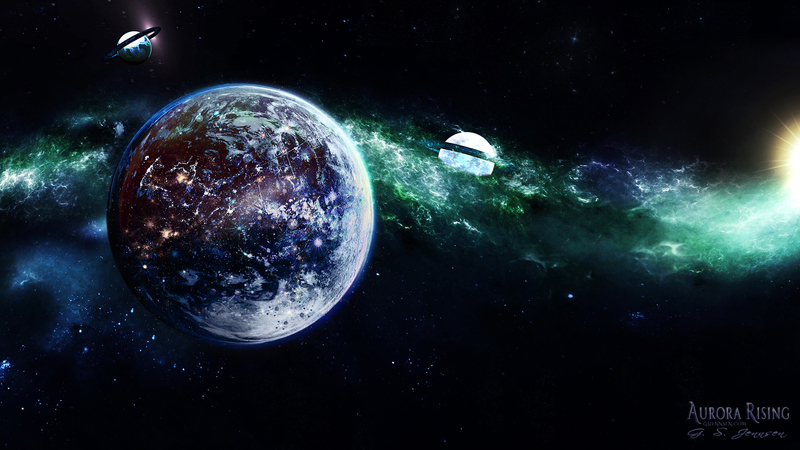 Initially, this was created as concept art for the home planet of an alien species I created for my Mass Effect fan-fiction series. 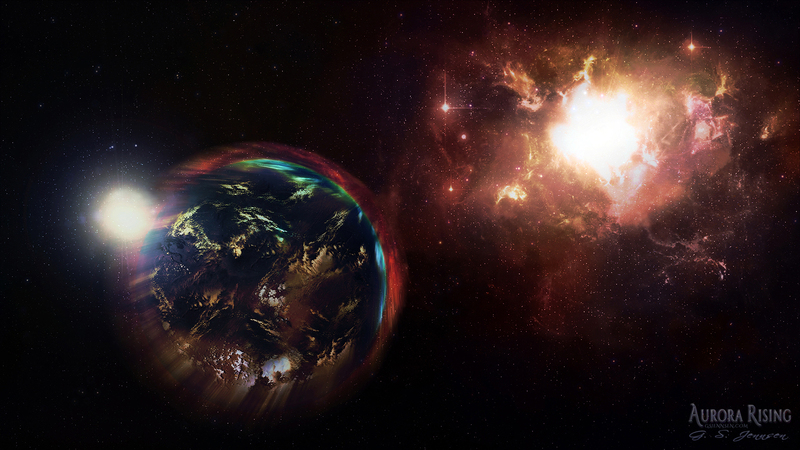 The aliens erected a planetary shield, using the energy from a nearby nebula to power it. However, I have a sneaky suspicion you may see something not entirely unlike this in, say...the 2nd Aurora Rising novel? Richard laughed. The word was immediately familiar, for once upon a time David Solovy had launched into many a speech on why vol’nosti—the inclination toward personal liberty and freedom—was worth fighting for, worth paying any price to safeguard. The speeches invariably transpired on a Saturday night after several drinks had been enjoyed by those present. The above is DISSONANCE's only mention of Volnosti, but I don't think it'll come as a surprise that it will play a huge role in ABYSM. So at one point in the book, [redacted] mentions wearing a Volnosti patch on the shoulder of their Earth Alliance uniform. And as soon as they mentioned it, I had to design one. Digitally, of course - crafts and I don't get along. 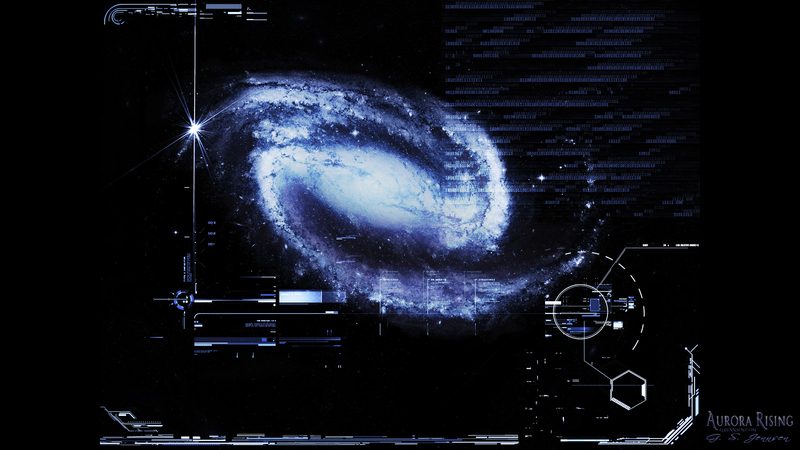 AEGIS will features prominently in Abysm and the Aurora Resonant trilogy. 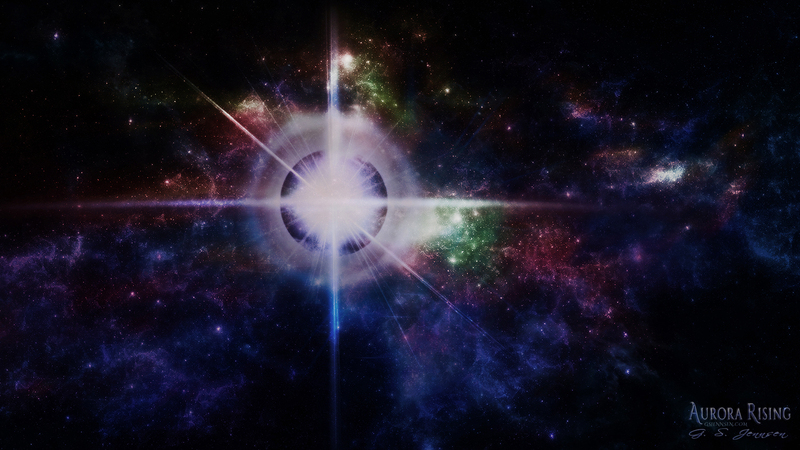 Concept art of one of the visuals Alex has captured in her travels and which appear on the wall in her loft: the gamma flare of a neutron star. This was created as concept art for the home planet of the primary alien species I created for my Mass Effect fan-fiction series. However, it is also intended to represent the larger of concept of highly-advanced civilizations that harness the energy of their planet, moons and sun. G. S. Jennsen lives in Colorado with her husband and two dogs. Of A Darker Void is her eleventh novel, all published by her imprint, Hypernova Publishing. She has become an internationally bestselling author since her first novel, Starshine, was published in March 2014. She has chosen to continue writing under an independent publishing model to ensure the integrity of her series and her ability to execute on the vision she’s had for them since their genesis. 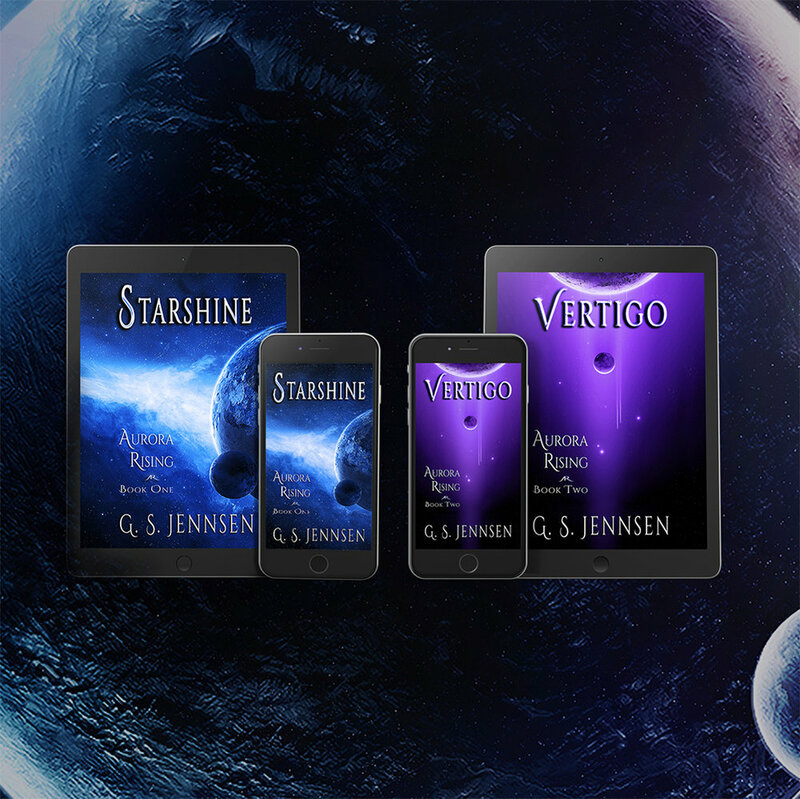 G. S. JENNSEN can be reached at gs@gsjennsen.com.